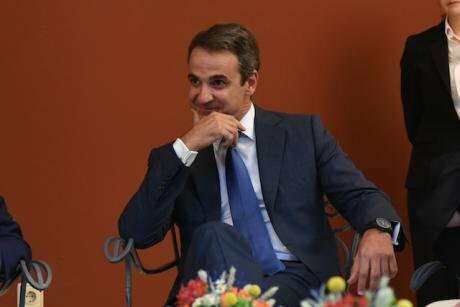 Leader of Opposition, Kyriakos Mitsotakis, New Democracy, on the occasion of the 43rd anniversary of restoration of Democracy at the Presidential Palace in Athens, Greece on Monday, July 24, 2017. NurPhoto/Press Association. All rights reserved.Greece has had more than its fair share of European and international headlines during the past years of crisis and austerity. Whether it was a looming bankruptcy, another bailout programme, mass protests or the complete realignment of its political system, commentators around the world were quick to catch up with developments in the sunny corner of the Mediterranean. But the last couple of years have seemed rather ‘quiet,’ giving the impression that not much is happening any more in the austerity-ridden country. Greece seems to have left deficits behind, with the economy slowly growing again, while EU Summits and Eurogroup sessions have lost their thriller-like character, reaching one positive resolution after the other on the country’s third adjustment programme anticipated to conclude in the summer of 2018.
Who is to blame for today’s polarisation? Not surprisingly, their populist character has often concerned analysts and commentators who speculate on the possible consequences for Greece’s liberal institutions, minority rights, the economy, etc. Nowadays it is also (if not mostly) the centre-right opposition that has violently pushed the debate towards extreme polarisation and political enmity. But nowadays it is also (if not mostly) the centre-right opposition that has violently pushed the debate towards extreme polarisation and political enmity, feeding the public sphere with conspiracy theories, nationalist stereotypes, and even threatening that they will ‘crush’ or ‘skin’ (!) their political opponents and the PM himself. Regardless of whether the allegations prove true or false, the practices of big pharma seem to have resulted in losses of billions for the Greek economy, at a time when the majority of the people have had to endure severe cuts in pensions, salaries and welfare. In this article I am not going to deal with the ongoing investigations into the alleged ‘scandal.’ In no position to have an informed opinion on the involvement of senior officials in the case, I do firmly believe that anyone under such serious accusation should be considered innocent until proven guilty – a stance sadly not respected by several senior members of the Greek government. What I want to discuss is rather the turn of the main opposition party of Greece, ND, to the right, as well as its extremely polarising communicative strategy, one that draws on moralistic divisiveness and nationalist rhetoric, while attacking independent institutions like the judiciary. This strategy that has been presided over by its hard-right vice president Adonis Georgiadis (a politician notorious in the past for his anti-Semitic and racist views) and the ex-PM Antonis Samaras (whom on several occasions has chosen to wage war against ‘illegal immigrants’). This path is leading ND in the opposite direction from what analysts and commentators expected when they saw the rather ‘technocratic’ and mild, Kyriakos Mitsotakis rise to the party leadership in 2016. Then, the party was expected to consolidate its profile as a centrist, liberal and uncompromisingly Europeanist political force. The past few months have confirmed that this is not the case. Past months have witnessed more indications of a shift to the right as the new leader of the party has found himself supporting or opposing policies that contradict his liberal profile. But this shift to the right did not come out of the blue. On the contrary, signs that a centrist turn would be unlikely had appeared rather early on. First, immediately after his election in the party’s leadership, Mitsotakis appointed Adonis Georgiadis, a representative of the hard-right faction of the party, former MP of the radical right Popular Orthodox Rally (LAOS) and one of the most controversial politicians in the Greek parliament, as one of his vice presidents. Georgiadis is known for his constant presence on TV channels and his loud eccentric style, as well as for hosting a TV-sales programme selling books and sometimes obscure products like a ‘nanobionic’ vest with supposedly therapeutic properties. His flamboyant personality and vitriolic attacks on opponents have often shadowed ND’s president and PM-in-waiting, setting the tone for the party’s public presence. Adonis Georgiadis, Vice President of New Democracy party and deputy, during the session of Hellenic Parliament, August 2017. Dimitrios Karvountzis/ Press Association. All rights reserved.Past months have witnessed more indications of a shift to the right as the new leader of the party has found himself supporting or opposing policies that contradict his liberal profile. For example, in October 2017, and despite Mitsotakis’ earlier pledges, ND opposed the legal recognition of gender identity, finding itself siding with the Greek Orthodox Church and the neo-Nazi Golden Dawn. 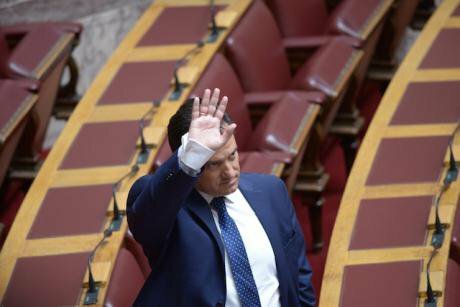 The bill was also voted down by SYRIZA’s right-wing partner, ANEL, but passed with votes from the centre and centre-left (Potami and Pasok). Alexis Tsipras and SYRIZA MPs spoke that day in parliament on the need to expand the rights of the marginalised and ‘invisibles,’ advocating a politics of inclusion and tolerance. Mitsotakis, on the other side, responded by referring to a story about a teenager who had allegedly decided to change his gender after discussing this with an extra-terrestrial on a mountain near Athens. The point he wanted to make was that people at the age of 15 are too immature to decide on their gender. Leaving the absurdity of the story aside, this argument ridiculed the right of transgender people to self-identify as they wish, while ND’s choice to oppose the bill went against the decision of the Court of Athens and defied calls by human rights organisations like Amnesty International. A few months later, Greece’s dispute with the Former Yugoslav Republic of Macedonia (FYROM) on its name would – after a decade – return to the limelight due to the resuming of negotiations between the two countries. This was facilitated by a change of government in FYROM, which now had a moderate social-democrat politician as Prime Minister. Zoran Zaev has consistently opposed the nationalism and irredentism of his predecessors and is advocating a swift solution to the name dispute towards the consolidation of a stable and mutually beneficial relationship with Greece. The leadership of the Greek foreign affairs ministry proceeded in a decisive yet conservative manner, picking up the negotiations from where its predecessors had left them. They adopted the position that the solution to the dispute should entail ‘a compound name with a geographical qualifier before the word “Macedonia”, which will be used in relation to everyone (erga omnes), for all uses domestic and international.’ This had been supported by ND in the past and by former PM Kostas Karamanlis when the party was in power (2004-2009). Such a position is also a retreat from the views that several key members of SYRIZA had previously expressed in favour of recognising the country by its constitutional name, the name by which it is known and referred in most of the world: simply Macedonia. Prominent members of the Greek Orthodox Church were at the very centre of the rallies, which were also embraced by the neo-Nazi Golden Dawn. Reactions from ultranationalist, religious and extreme-right groups against any solution that would include the word ‘Macedonia’ soon started to gain traction. And while ND seemed at first ambivalent towards these mobilisations, it soon ended up supporting them. The two rallies that took place in Thessaloniki and Athens were expressions of pure nationalist pathos with alarming authoritarian, racist and anti-democratic elements. At centre stage in Thessaloniki one could find a former general as well as high ranking ex-military officers, speaking about the defence of the nation’s ‘soul,’ advocating drastic solutions against the ‘traitors’ of the nation, even implying the possibility of a coup against the government. Prominent members of the Greek Orthodox Church were at the very centre of the rallies, which were also embraced by the neo-Nazi Golden Dawn. Instead of condemning such alarming phenomena, or at least keeping some distance, the leadership of ND accused Tsipras and his government of not being able to listen to the people’s ‘patriotic sensitivities.’ And with negotiations between Greece and FYROM still ongoing, ND now looks as if it will do whatever it can to undermine a solution to the ageing and counterproductive dispute between the two countries. Like usually happens with perfect storms, the ‘Novartis scandal’ emerged in headlines immediately after the nationalist rally in the centre of Athens. This was an issue with a recurring presence in the media for more than a year, but this time the names of former senior officials that were involved in the investigations were revealed to the public. The immediate reaction of ND along with that of prominent politicians of PASOK, like former deputy PM Evangelos Venizelos, was to claim that this was all ‘a villainous scheme’ of the government, a conspiracy of the PM himself, who, along with members of his cabinet had manipulated the judiciary and even guided the testimonies of anonymous witnesses to politically ‘assassinate’ the government’s opponents. There are so many things that feel wrong in this statement, but let me just highlight the more obvious ones: (1) the severe refugee crisis of 2015 is not acknowledged, it is as if the unprecedented flows of people from Syria and the Middle East to Europe were a result of SYRIZA’s open border policy, as if there was never was a war in the region; (2) refugees, asylum seekers and economic immigrants are not recognised as such, but all are reduced to ‘illegal immigrants’ (a derogatory and offensive expression now banned in major news agencies and explicitly avoided by EU institutions); (3) humanitarian NGOs that played a key role in saving lives across the Aegean and sheltering refugees and immigrants are presented as the agents of human smugglers; (4) the government appears to have ‘let into’ the country one million and a half ‘illegal immigrants’ – a hugely exaggerated number of the refugees and immigrants currently living in Greece (estimated at around 60,000). In other words, the former PM and leading figure of ND seems to have fully embraced the incendiary anti-immigrant and xenophobic rhetoric of Europe’s radical and extreme right and of people like Marine Le Pen or Geert Wilders. Quite interestingly, no one in or around the party has reacted against this. What is more, the silence of Greek liberal-centrist and moderate intellectuals in front of Samaras’ anti-immigrant rant could not be more striking. What is more, the silence of Greek liberal-centrist and moderate intellectuals in front of Samaras’ anti-immigrant rant could not be more striking. In this context, it is not an exaggeration to say that the conservative opposition’s presence in the Greek public sphere during the past months has been fuelling bitter confrontations, creating the conditions for the further alienation of citizens not just from the political system and parliamentary politics, but also from the institutions that safeguard liberties and the rule of law. In other words, ND’s new polarising strategy is not just leading to the further moralisation of politics, it is also spreading a culture of conspiracy mongering and is severely discrediting the judiciary system of Greece as well as the government itself as an institution. Even if in the end investigations on the Novartis case by the authorities proceed in a paradigmatic and ethically flawless way, closing the case, the fact that on an almost daily basis there are high-profile politicians of ND and PASOK in the media, advocating that prosecutors are merely puppets in the hands of a ‘corrupt government,’ has already caused severe damage to the image of the judiciary and the political system as a whole. Add to this the fact that within the past few weeks ND has not hesitated to use the foreign relations of Greece, and more specifically recent tensions with Turkey in the Aegean Sea and Evros border, as a means to attack the government, and one can easily see the possibility of polarisation escalating further, with consequences reaching beyond Greek borders. ‘Illiberal’ populists against ‘liberal’ moderates? Indeed, the sitting government in Greece, a coalition of a populist radical left and a populist-nationalist right party, is no stranger to polarisation. It actually rose to power by mainly following an ‘us versus them’ campaign, rallying its supporters against the parties of the ‘old establishment,’ pledging to put an end to austerity and to radically renew the political system. In practice, after immense pressure, it has chosen to sign yet another new bailout programme, following the dictates of its EU partners and lenders in most policy areas, thus furthering austerity. Now, if one judges by the reactions of top EU officials, it seems that the SYRIZA-led government has carried out most of the agreed structural reforms in a rather effective way. As for the ‘liberal’ component of democracy in Greece, which various commentators had considered under threat, one could point to several ambiguous tendencies, but it is obvious that there have not been any major setbacks. On the one hand, there have been positive developments on various fronts, especially if we take into account the several bills passed to recognise and consolidate the rights of ethnic minorities and immigrants as well as the rights of the LGBTQ community. On the other hand, it is a fact that the current government has not kept the institutional distance that it should from cases like the Novartis case, discussed above. Instead of leaving the prosecutors to do their job independently and respecting the presumed innocence of the senior officials under investigation, ministers were quick to state that this is the ‘biggest scandal’ from the very foundation of Greece as an independent state. In this sense, the government did not respect the independence of the judiciary to the extent that it should have. Moreover, it has used the case as an opportunity to attack and discredit its political opponents. But I have chosen to focus more on the other side here, that of the centre-right (and centre-left) ‘moderate’ opposition in Greece. On the forces that have very often been uncritically portrayed as the ‘liberal’ Europeanist pole of the Greek political system. And I am doing this for a specific reason. The point I want to make is that things are not as simple and tidy as often presented by mainstream media, popular academics and pundits: it is not just the ‘illiberal’ populists against the ‘liberal’ moderates. It is not necessarily the former that are threatening institutions, checks and balances, the rule of law, democratic culture and so on, against the latter, the enlightened forces of political moderation and liberal consensus that safeguard democratic values and institutions. The dynamics of the political game in Greece – as in Europe and beyond – are increasingly much more complex. Both ‘sides’ have at times articulated their politics in ways that have been more or less liberal, more or less ‘responsible,’ and indeed more or less transparent or democratic. But while commentators around Europe are always quick to join the fight against the alleged ‘populists,’ and even write articles advising the ‘liberals’ (as if they were a coherent camp) on how to defeat them (as if all populists are the same and should all be defeated), what is often ignored is the mainstreaming of nationalism and nativism, the legitimization of illiberal and indeed of anti-democratic ideas and practices by established ‘moderate’ political forces. What is often ignored is the mainstreaming of nationalism and nativism, the legitimization of illiberal and indeed of anti-democratic ideas and practices by established ‘moderate’ political forces. Greece’s centre-right seems to be moving on a similar path to some of its European counterparts. And given that ND could win the next general election, this might have significant consequences for the country. In such a scenario, we could see ND’s trumpesque vice president, who constantly threatens to ‘crush,’ ‘obliterate’ or jail his political opponents, as a deputy PM or leading a key ministry. This would not be good news for Greece and its democratic institutions, nor for Europe. But it does not make any headlines. Nobody considers such a politician a ‘threat’ like they considered, for example, Tsipras or Pablo Iglesias not so long ago. In this sense, it seems that demands to reverse austerity or to even slightly deviate from Europe’s fiscal orthodoxy is a far more dangerous idea than targeting immigrants, fuelling nationalist sentiments or attacking the judiciary and protected whistleblowers. It seems that demands to reverse austerity or to even slightly deviate from Europe’s fiscal orthodoxy is a far more dangerous idea than targeting immigrants, fuelling nationalist sentiments or attacking the judiciary and protected whistleblowers. To be sure, post-Brexit Europe is facing many challenges. The consolidation of illiberal authoritarian parties in specific countries (e.g. Hungary, Poland), as well as the further empowerment of the populist radical right in others (e.g. France, Italy), are definitely among the most serious ones. But the story does not stop there. Democratic institutions and ideas as well as the prospects of creating an open, diverse and tolerant society are also threatened by the mainstreaming of nationalist/nativist, authoritarian and anti-democratic ideas as expressed by established political forces. Mainstream media and commentators tend to ignore this, often creating the picture of a unified and embattled moderate ‘centre’ that is defending Europe and liberal democracy against anti-establishment populist challengers on the right and the left. But what was considered ‘moderate’ or ‘mainstream’ in the past has been changing, with the centre-right coming alarmingly closer to the radical right, especially on issues related to immigration and the ‘law and order’ agenda. We need to acknowledge this and to critically discuss the possible consequences of this broader shift. At the same time, we need to reflect upon the very state of liberal democracy itself and on its postdemocratic tendencies, overcoming convenient yet counterproductive dichotomies such as ‘populism vs. liberalism,’ ‘rationalism vs. irrationalism,’ and so on and so forth. The much-needed reinvigoration of democracy does not necessarily pass through ‘more liberalism’ or ‘more Europe.’ Democracy can (and should) become more inclusive, more participatory, more deliberative, more redistributive, more passionate, and in some respects even more populist – building on constructive agonistic confrontation, holding unresponsive elites accountable, taking collective identities seriously, bringing the demands of the marginalised and disenfranchised to the fore.